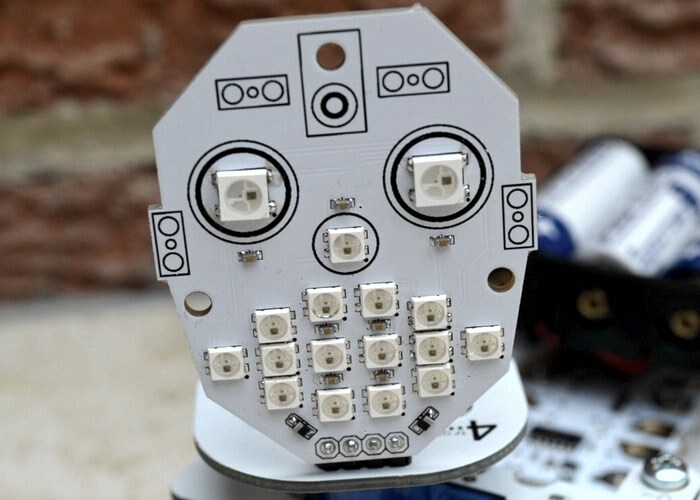 Makers, hobbyists and developers but are looking to add a little extra personality to their next electronic project that uses an Arduino, Raspberry Pi, Crumble, Codebug or Micro:Bit mini PC might be interested in a new robotic face called McRoboFace. McRoboFace has been specifically designed to be used with the aforementioned mini PCs and allows you to easily add character and humour to your creations. Check out the video below to learn more about the installation, inspiration and features of the McRoboFace created by Gareth Davies at 4tronix. We all like adding blinky LEDs to our electronics creations, whether it is a robot, weather station or something that reads and displays sensor data. Now with McRoboFace you can add emotions to everything at the same time as adding blinkies. All the 17 RGB LEDs are fully addressable and can be controlled by most processors in the field using standard “neopixel” code. This includes Raspberry Pi, Crumble, Arduino, ESP8266, micro:bit and Codebug. McRoboFace has 17 fully addressable LEDs. These will be WS2812B or SK6812 (fully compatible products). Each McRoboFace will be supplied fully assembled and we will include a 4-way right-angle male header which you can solder on if required. This makes it easy to plug directly into a breadboard. McRoboFace is now available to back via Kickstarter and is available to early bird backers from £5. If you enjoy building Pi projects you might be interested in our comprehensive list of Raspberry Pi displays, HATS and small screens.